The KAMAZ crews in the Dakar-2014 rally-marathon were subjected to events beyond their control. However, the main battle is still ahead. In South America, the third most prestigious Dakar -2014 rally-marathon has just been held. In the class of trucks, where the Russian team Kamaz Master has been traditionally strongly represented, the leadership is still held by the Dutch racer Gérard de Rooy in Iveco. Following de Rooy are four Russian crews on the KAMAZ trucks. Initially there were five KAMAZ crews, but by the second stage, Ayrat Mardeev’s quartet had to withdraw from the rally. The incident occurred on the 386th kilometer of the San Luis – San Rafael segment. The truck driving along the shore of a dried river capsized because of collapsed soil. The car was returned to its fighting condition, but the organizers decided to exclude the silver crew medalist Dakar-2013 from the race. The reason for that is the GPS will be disconnected in the fall, and this is strictly prohibited by the rules. The Russian team filed a protest against the organizers decision, according to the KAMAZ mechanics, the problem in GPS occurred spontaneously. Nevertheless, Mardeyev’s crew is forced to go back to Russia, which is very sad since Mardeyev had a great start in this marathon, winning in the first stage. To de Rooy’s credit, he was following behind Mardeyev, but he stopped to that he and his partners in the crew could help his rival, who had been hurt in the accident. The Iveco spent about 20 minutes in an emergency stop; during the revision of the second stage results, it was enough for de Rooy to lead the overall event. In Mardeyev’s absence, last year’s Dakar bronze medalist, Andrey Karginov, who had won the third stage, picked up the Russian leader’s banner. Certainly, the fourth segment of the rally would have been a triumph for him, but he had a punctured tire at a crucial moment. As a result, Karginov finished the fourth stage 15 minutes behind de Rooy. "In the morning we started the stage fully armed, but the special stage was very heavy,” Karginov said. “There was a lot of dust and stones that made the track very insidious. We were in the lead most of the day, but in the second part of the stage we had a punctured tire. We lost time changing it, and Gérard de Rooy was able to overtake us. In fact, we had no time left to try to catch up with him." Meanwhile in the general classification, the gap between the Dutchman de Rooy and the best out of all the Russians, Andrei Karginov, reduced to 32 minutes. 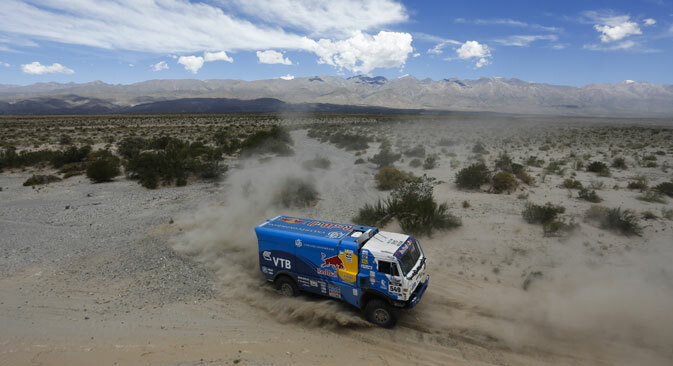 Most of the Dakar is still ahead, and as the KAMAZ practice shows, it can still change at any moment of the race. Based on materials from Rossiyskaya Gazeta and ITAR-TASS.